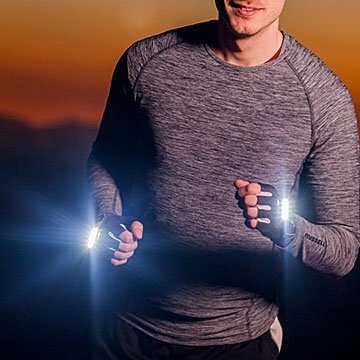 Illuminate the trail or task ahead with the hands-free light of these gloves. Ever tried to run holding a flashlight? Or opted for a headlamp and been mistaken for a miner? Run or work in low light more safely with these gloves that sport LED lights and reflective trim. They're designed with pockets that hold powerful, four-bulb packs to beam light onto the trail or task ahead. And leave your fanny pack at home, because there's a pocket in each palm to hold cash, keys, or other small essentials. The light lasts for up to 10 hours, but when it's time for a charge, just slip the included USB cable into the openings in the gloves and you'll be ready again for any outing—in any season, thanks to the lightweight, breathable material. Made in China. Great fit, light shows in front of you while you run, easy to put on. I would recommend for any runner to have these gloves! These are perfect for running and definitely make you feel safer on early morning runs. My adult son does not like to put on reflective vests when he runs but he liked the construction and ease of use of the light gloves. He also thought his father-in-law would like a pair for working on cars and in the workshop. That my son intends to use while running is the biggest success of all for me. These gloves are not just good for running - for anyone who has outdoor winter activities like dog walking after work, shoveling, getting firewood etc. it's like having your flashlight built into your gloves. I got them for my husband but will get a pair of my own for my winter dog walks. I really wanted to love these! I was so excited to get these! Then, unfortunately, they arrived with a large hole in one of the seams. :( I got the gloves to walk my dogs during the winter. It is completely dark in the mornings, so I thought these would help. I will say that I was surprised at how bright the lights are. Plenty bright enough to substitute for a flashlight. This seemed like such a great idea! I could walk all three of my dogs without needing a hand for a flashlight! However, the fabric that the gloves are made from is not high quality and neither is the sewing. The gloves are very thin and have strange connectors between the fingers. For an item that I would love to wear on a daily basis, these are not tough enough. Nothing about them is sturdy. Maybe they would be good for more casual uses. If you need to find something in a dark basement or garage, and need both hands to carry stuff out? I've sent Uncommon Goods an email, so I'm hoping that good customer service can resolve my issues. Use these at night to walk the dog. Amazing! My mom loved these when I got them for her to run and walk the dog.